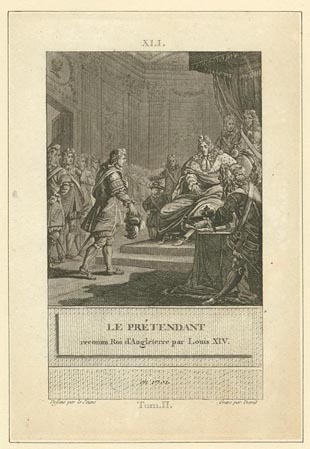 This French engraving shows King Louis XIV of France acknowledging James VIII & III as king of England. Louis supported the exiled Stuarts both for reasons of pragmatism and principle. A Jacobite revolt would have crippled Britain's ability to fight France on the European mainland, while also restoring a fellow royal family to their divinely-ordained rights. The eventual consolidation of the Union should not disguise the fact that it faced a number of serious challenges in the decades after 1707. An alternative Stuart vision of union endured after 1707. With intermittent support from the European enemies of the new British state, such as Spain, France, Sweden and Russia, Stuart supporters (Jacobites) continued to oppose the Union of the Parliaments. Following the death of the exiled King James VII and II in 1701, Stuart hopes passed to his son, James VIII & III, the 'Old Pretender'. In the short term the Union's popularity was undermined by a number of political, economic and religious factors, including the abolition of the Scottish Privy Council, increased taxes on a number of goods and a perceived threat to the predominance of the Presbyterian Kirk. These developments were in direct contravention of the articles of union. In 1713 an attempt in the House of Lords at Westminster to bring in a bill to dissolve the Union failed by only four votes. The next three decades witnessed political and military conflict over which form of union would bind the British-Irish Isles. The military defeat of Jacobitism during the 1715 and 1719 risings and its eventual suppression in 1746 secured the long-term future of the 1707 settlement.